Now that I know you’re still doing animal posts, here are some pictures I took of the cats a little while ago. I tried to play cricket with them, but they were uninterested. In fact, they were indifferent. In FACT, they made such a point of making their feelings clear that you might say that they were conspicuously indifferent. The first picture is Granville (who reminds me of a gone-to-seed version of your Monty) being out first ball because of his indifference, in one of the easiest LBW decisions ever for the umpire (my mum). He’s choosing to stare into space instead of keep his eyes on the ball. The second is Carlo (the ginger) just before he was out bowled through his legs offering no shot. (Carlo said to say that he wants a good caption otherwise he’s joining Pollock, Collingwood and Chapple and coming after you). The final picture is during my innings. The cats were seriously sloppy in the field. As you can see, there has been a hilarious fielding mishap when their indifference meant that the ball fell between them. 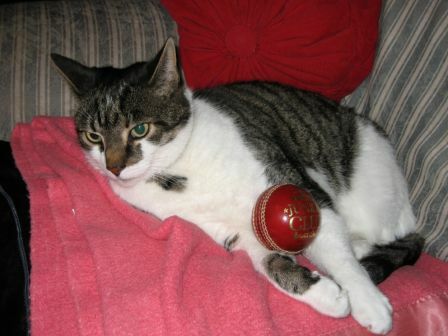 As you see, Miriam didn’t know we were still accepting pictures of animals being conspicuously indifferent to cricket, but of course we are. E-mail us anything, in fact. Maybe you’ve got a beautiful picture of Rob Key. Maybe you’ve stood near a sign saying ‘moron centre’ while wearing the England one-day shirt. Whatever. Anything to give us a free update. Full marks for making the pictures the right size for the site as well Miriam – even if it was a coincidence. I don’t blame Carlo for his dismissal in the slightest. Any wicket with a tassle rug on the batsman’s crease is bound to cause unpredictable bounce. He’s merely taking evasive action. The picture size was a total and utter coincidence – I couldn’t re-size a picture if I tried. Carlo’s end of the pitch does admittedly have plenty of rough in it, unlike Granvilles, which is almost literally a featherbed. If Carlo was that afraid, though, perhaps he should have gone along with my suggestion that he wear some headgear (believe me I tried). Cats are notoriously difficult to fit headgear on. It’s one of the few disappointing things about them. Y. I’ve even tried doing that thing when you make a cat helmet out of an orange peel, but they didn’t like it. Carlo turned his nose up at it, and Granville just kept his default pose (ears back, look of disapproval).